Ok folks, It's December and it's the time for giving and good will. With the materialism and hectic pace surrounding the holidays, it's refreshing that two people are trying to make a change for a better world. Chase the Rising Sun is a social mission that sprouted from a desire to travel around the world. Lauren and Michael Crigler are giving up everything that defines their personal lives to combine their dreams of traveling with their passion for improving the quality of life for others. Driven by their intense respect for the environment and their appreciation of cultural diversity, they'll be traveling to various destinations around the world, volunteering their skills, knowledge,and lending helping hands.Their utmost goal is to spread awareness and inspire others to give back to the world. Chase the Rising Sun is about taking an initiative for the betterment of the world. Lauren and Michael hope to inspire others to chase their dreams while making a positive change through influential action. 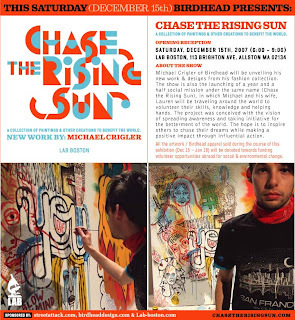 Through Chasetherisingsun.com you can follow Michael and Lauren on their journy, read about their travels and experiences with the people and orgainizations they are working with. You can even get involved yourself by reading up on these causes and giving back in the form of a small donation to one of the groups they are working with. I received an email this AM and Eco Chic Weddings posted an article on my artwork! I am shocked!! Happy New Year Denise Mass.